Populated by British Colonials, Kenya's Kikuyu and Maasai native tribes and kind Scottish missionaries, this mystery evokes all the diverse interests at play in 1911 Africa. The murder of the white doctor at the Mission Hospital appears obvious to authorities who wish to protect the British expats by railroading the local witch doctor. The missionaries' daughter, born in Africa and raised among the natives, along with Assistant District Superintendent Tolliver are dedicated to finding the truth, wherever that leads. Set in the scenic splendor and exotic wildlife we witnessed in Out of Africa (Denys Finch does appear) The sentiments and resolutions are unexpected. It's 1911, and young Vera McIntosh is in love and out of place. Pale and Scottish, a missionary's daughter, she no longer fits in with the Kikuyu with whom she grew up. But she is too African, too native to be welcomed by Kenya's ex-pat community. It's only in Justin Tolliver's arms that Vera feels truly at home. Tolliver, too, is neither fish nor fowl. True, he's the son of an English earl, but critically he's a younger son, with no money, no prospects, and no options beyond a job with the much scorned colonial police force. Worse, he's begun to have serious doubts about the policies of the government he represents doubts that only multiply when Vera's rakish uncle is killed and Tolliver's superiors make it clear they d like an African to take the blame. 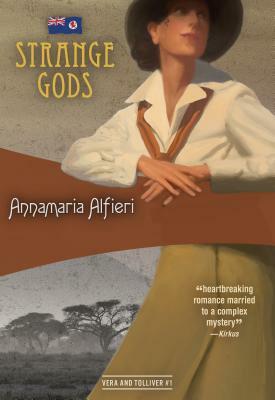 Annamaria Alfieri, actually named Patricia King, is a New York based writer of historical fiction. After writing a number of well-received nonfiction books that landed her an appearance on the Oprah Winfrey Show, she went on a trip to Bolivia that inspired her to write her first mystery novel; she has since written 3 standalone historical mysteries set in South Africa, and is at work on the second novel in her British East Africa series.